As a researcher for the Northeast Washington Genealogical Society in Colville, I came across an intriguing story that I want to share with you in hopes you can help me find the ending to the story. 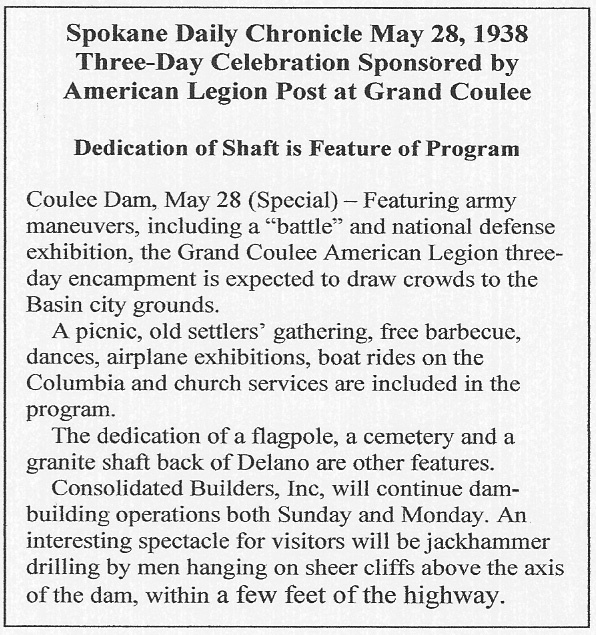 While researching another subject, I came across some newspaper articles in the old Colville Examiner about a monument that has had an interesting history and a direct link to the Grand Coulee Dam Project. Perhaps you will also find the story of interest. In April 1938 John Citkovich, well-known monument maker of Colville, was commissioned by the Grand Coulee American Legion to create a monument to honor those who died during the construction of the Grand Coulee Dam. The monument was to be a 10 foot granite shaft, made of blue Georgia granite, and would weigh about five tons. Space for 75 names would be provided on each side of the monument, and it would be erected at the dam site. It would be the largest monument ever made in Colville and one of the most beautiful ever erected in the state. Over the next month, Mr. Citkovich ordered and received the beautiful Georgia granite stone, shipped by train to Spokane. In less than a week from the time he received the stone, working day and night, he completed the monument. It had a beautiful design with a “large amount of delicate figure work, including an American Legion emblem and an attractive border.” The finished shaft was actually 10 ½ feet tall, six feet wide at the base, 20” wide at the top, and weighed about seven tons. “Shrouded in the deepest secrecy,” he delivered it to Grand Coulee on May 25, 1938, with a bill for $1,725. The monument was to be “unveiled” and dedicated on Memorial Day during a three-day national defense program to be staged at the dam. Then Governor Clarence D. Martin would be present during the ceremonies. By this time, 49 men had been killed on the project. A list of 46 names was provided to Mr. Citkovich, probably compiled by the American Legion since it was the Legion who sponsored the monument. The first three who died were not on the original plaque. The monument was to be placed “on a four-acre plot facing the permanent highway leading to the damsite.” The lot was to be beautifully landscaped and would be “kept up through a trust fund being created by the Grand Coulee Legion post.” It was actually put in place “at the proposed cemetery behind Delano” along with a 90 <sic> foot flag pole, erected by the International Order of Odd Fellows (IOOF), to be dedicated at the same time. By June 1939 Mr. Citkovich had not received payment for his work (except for a $200 deposit) and he says that if payment is not received “within a short time” he will remove it and advertise it for sale. 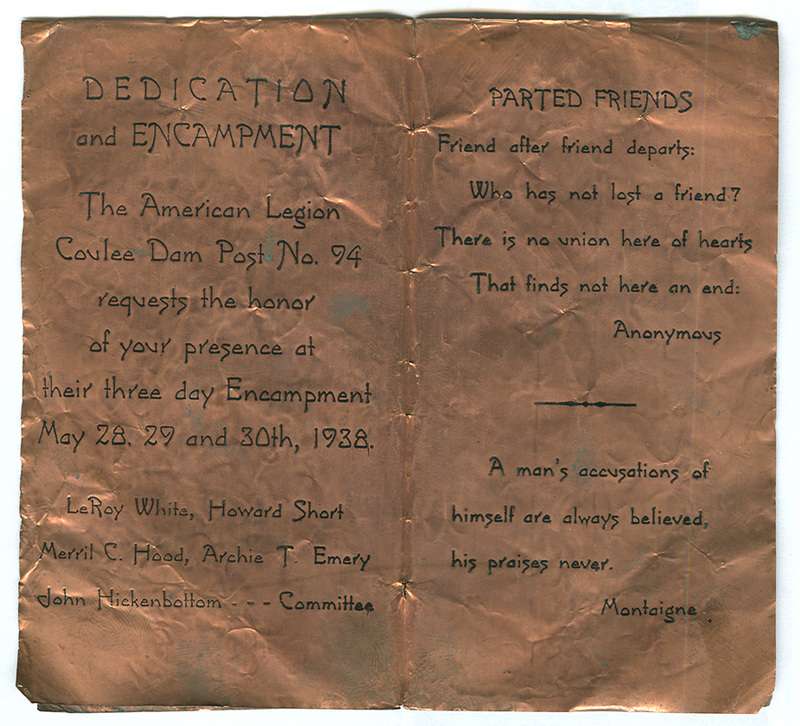 He originally contracted with the Grand Coulee American Legion, but it seems that the Legion commander disappeared about the same time as the funds collected to pay for the monument. 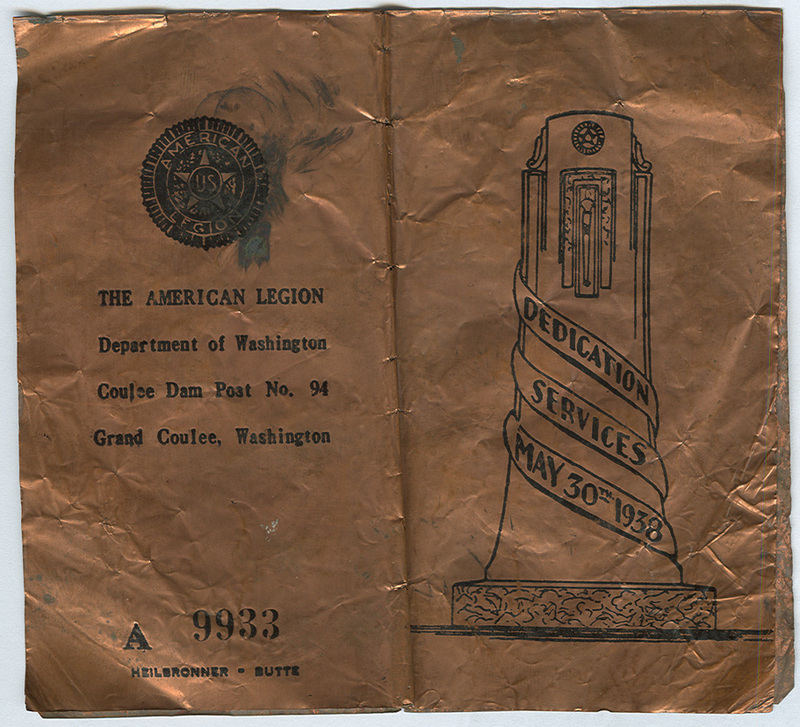 Copper programs for the dedication ceremony had been sold to raise the money. The city of Grand Coulee and various civic organizations and unions asked him to give them a little time in which to raise the money (again). He said that ‘he would much rather leave the monument as a lasting memorial to the heroism of those who have given their lives to make possible the largest structure ever built by man,” and so he agreed to wait until the first of July. By June 1940 no payment had been forthcoming, but the Grand Coulee group finally offered Mr. Citkovich $500. “If I’m going to give this beautiful piece of statuary away, I would rather see it come to Stevens county rather than to let it stay at the dam,” Citkovich stated. And so John Citkovich’s son, Jack, just a young boy at the time, remembered the day they picked up the monument. They “took a flat bed truck with a hoist. Jim Kitt and another man went with us. 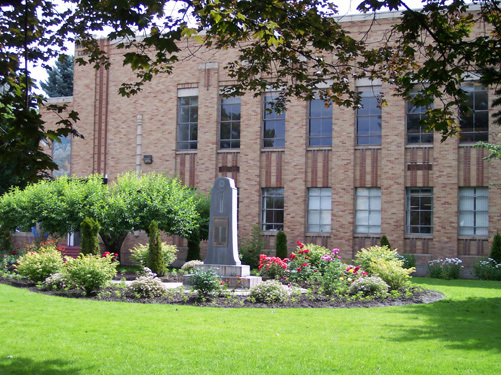 We expected trouble so we took rifles along, but no one challenged us and we drove up to the monument, loaded it up and just drove off with it.” Upon arrival back in Colville, Jack believes that the monument was set in place where it still resides today….in front of the courthouse in Colville. Stevens County ended up paying $750 for it and was going to dedicate it “to the Stevens county war dead.” At this time, the shaft was reported to be 11 ½ feet tall. In 1982, with the “forth-coming 50th anniversary celebration of the start of construction of the Grand Coulee Dam,” there was renewed interest in the monument. People suddenly realized that the monument was “missing” from the Grand Coulee site. 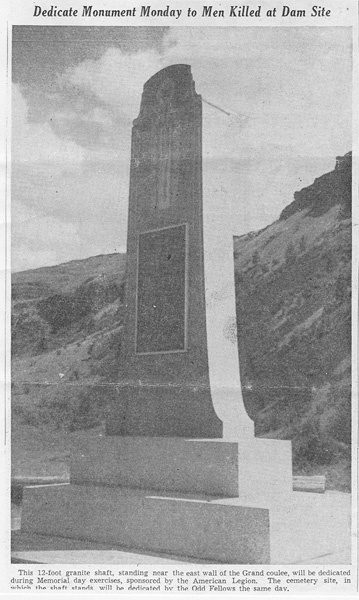 On July 23, 1982, the Wenatchee World ran an article by Hu Blonk relating the history involved and the fact that the monument had been “found” in Colville. Also noted in the article was the fact that the shaft was now 12 feet tall and that 77 nameplates would have been attached to the plaques if it was still honoring those killed during the construction of the dam. When I put this story together, the Bureau of Reclamation had no idea that there had ever been a monument at the dam. They had absolutely no record of it. No one could tell me what names were on that original list of 46. No one could tell me where the monument actually sat for two years. I have driven through the Delano area and there is no cemetery and no 90-foot flag pole. The answers to those two questions have been “lost” for over 60 years. I am happy to report, however, that I have been able to locate the site where the monument stood for those two years. After I published an article in “Nostalgia Magazine” in January 2007, I received several responses which helped me to find the approximate location. With the help of two photographs (showing a distinctive skyline behind the monument), the Public Affairs Officer for the Bureau of Reclamation in Grand Coulee, a local Grand Coulee historian, a local reporter, and a fortuitous encounter with a local resident, we pinpointed the exact site. The monument faced the river and stood on a little knoll across from the flat area just east of where the Delano rodeo grounds are today. We could definitely identify the rock formations seen behind the monument in those original photos, and this back road through Delano today was a major road through the area back in the 1930s and 1940s. The “proposed cemetery” never happened and there is now a big hole where the cemetery was to have been, the material removed and used during the construction of the dam. With help from several sources, I also solved the mystery of those original 46 names. I located a news item in the Spokesman-Review published in Spokane, Washington, which reproduced the list of names that appeared on the monument when it was set in place at Grand Coulee in May 1938. Since finding that initial article, I discovered that between 1933 and 1953 there were 77 men killed working on the Grand Coulee Dam Project. I later learned that 4 more people died during construction of the Third Powerhouse (1967-1975) bringing the total to 81. I believe that I have now identified all 81! Following is a list of the 81 names that I have identified (including the original 46) with the date of death. There are plans afoot to create an exhibit to honor these men for their sacrifice. If you have any information on any of these people, please contact me as I would like to write a short biography of each of these individuals to have available at the dam's Visitor Center. Susan Dechant, at 62 Lupine Hill Road, Kettle Falls, WA 99141 or sdechant@centurytel.net. Gallanar, Ray / Roy H. - 10/18/1937? Be sure to check out our Facebook page "Grand Coulee Dam Family" and join our group to share stories about your relatives who worked on the dam. read about the monument as it stands today in Colville by clicking on "Military Monument" on the menu at the left under "Search Now"